After her landslide victory, Lori Lightfoot speaks to her supporters as the Chicago’s first Black female mayor. On a historic night, Lori Lightfoot cemented her inspiring rise to political power to become Chicago’s first Black female mayor commanding a landslide victory over machine politics in the nation’s third largest city where there are more Blacks in public office than anywhere in the country. In the second mayoral runoff in Chicago’s 182-year history, she swept all 50 wards as she delivered a crushing defeat to her opponent, Cook County Board President Toni Preckwinkle, a Black female political “Boss” who after rising to political prominence, lost an election for the first time in 32 years. The evening also marked an unprecedented achievement for Chicago Blacks-one that set new records in Black political power in Chicago and Cook County. For the first time in the country, two Black women at the same time will lead Chicago, and Cook County, the second biggest county in America. Chicago is now the largest city to elect a Black female mayor. It joins 13 cities headed by Black female mayors. They include San Francisco, Washington, D.C., Atlanta, Baltimore, New Orleans, Baton Rouge (LA), Charlotte (NC), New Haven (CT) and Rochester (NY). In another historic victory, State Representative Melissa Conyears-Ervin became the city’s first Black female treasurer. Blacks in Chicago now head the nation’s second largest police department, the second largest transit system, the third biggest public school system as well as the Chicago Fire Department, the Chicago Housing Authority and the Water Department. With many Black residents struggling and disillusioned, some of these positions carry more symbolism than power and influence. With Lightfoot poised to take over, there’s the question of whether she will challenge or even shakeup the Black public leadership that Mayor Rahm Emanuel created, to restore trust with Black voters. Lightfoot will be sworn in next month and replace Emanuel, an embattled official who decided not to run for a third term after losing trust among Chicago’s Black voters amid the police shooting of 17-year Laquan McDonald. But the spotlight is on Lightfoot, a former prosecutor who was born to a working class family in Ohio. Thirty-six years after Harold Washington became the city’s first Black mayor, Lightfoot steps into the role at a time when hundreds of thousands of Blacks are leaving the city after years of crime, poverty and sweeping segregation among its Black and white residents. Lightfoot is also the city’s first openly gay public official. The evening set records on various levels in an election where only 30 percent of Chicago’s 1.6 million voters went to the polls after a long, highly publicized campaign season that for the first time saw two Black women vie for the city’s highest political office. Lightfoot’s victory is being viewed as extraordinary. She defied odds as a gay, political rookie who had never held an elective office. There was concern that she would not get the support of the Black electorate because of her sexual orientation. In addition to being an ‘outsider’ at City Hall, the Chicago Black Caucus as an organization did not endorse her, or publicly campaign for Lightfoot. A WGN poll on March 5 showed that Lightfoot led her opponent by as much as 53 percent to Preckwinkle’s 30 percent. Another poll showed that 29 percent of voters remained undecided on their candidate of choice. That left Preckwinkle’s supporters hopeful. But Lightfoot won anyway. Forty-six minutes after the polls closed at 7 p.m, Lightfoot was declared the winner. She grabbed nearly 74 percent of 498,154 votes that were cast. Lightfoot kept a massive lead over her opponent throughout the evening. When the first results appeared on the screens at her election night watch party at the Hilton Chicago on Michigan Avenue, cheers erupted from a diverse crowd of supporters in a packed ballroom where Reverend Jesse Jackson Sr., businessman Willie Wilson, activist Ja’Mal Green and several Black aldermen were in attendance. 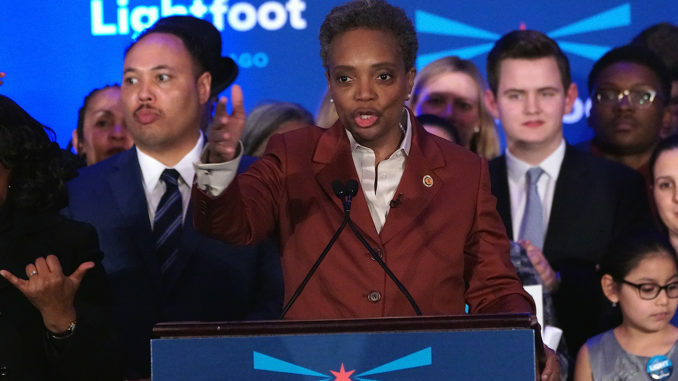 With her wife and daughter standing behind her, Lightfoot gave an 18-minute speech that highlighted her tough journey to victory and expressed her vision for Chicago. To hundreds of her supporters Lightfoot said, ‘You created more than just history. You created a movement for change. When we started this journey 11 months ago, nobody gave us much of a chance. We were up against powerful interests, a powerful machine and a powerful mayor. [Dr.] Martin Luther King said something when I was very young. Faith, he said, is taking the first step when you can’t see the staircase…We let our faith overcome our fears. Lightfoot also won all of the city’s Black wards, weeks after she was endorsed by Black businessman and former mayoral candidate Willie Wilson, who won 13 Black wards in the general election in February. Wilson’s endorsement is being viewed as a game changer in Lightfoot’s campaign, and his influence signaled his own rise to political prominence in a city that never took him seriously as an ambitious figure seeking to shake up Chicago’s political machine. His downfall gave rise to Lightfoot, a relatively unknown figure in the Black community who quit her mayoral-appointed job to take on Emanuel and the machine politics at City Hall. She stunned the city’s status quo after beating 14 candidates in the February 26 election with little support from big donors and the political elite. The victory added more fuel and momentum to Lightfoot as she remained defiant and outspoken about the city’s machine politics that for years have left many residents disenfranchised and disillusioned. Standing in Lightfoot’s way was Preckwinkle, a political heavyweight, who has grown after she helped put in office Cook County’s first Black female State’s Attorney Kim Foxx, and Juliana Stratton, the first Black female Lieutenant Governor of Illinois. After winning the Primary in March, 2018, Preckwinkle became the first Black female to serve as chairman of the powerful Cook County Democratic Party. Preckwinkle launched a negative advertising campaign that painted Lightfoot as an affluent attorney who built her legal career on defending powerful corporations while she served as a partner at the high-profile global law firm of Mayer Brown. But in the end, Preckwinkle’s ties to the corruption scandal of Alderman Ed Burke played into her opponent’s message that she is part of Chicago’s political machine. And Preckwinkle’s negative attacks only boosted her negative image as a mean-spirited public official. In the final weeks leading up to the runoff election, the two racked up political endorsements at a pace not seen before in recent Chicago memory. Lightfoot was endorsed by the city’s daily newspapers and several Black aldermen. Many of Preckwinkle’s endorsements came from unions. Former President Barack Obama and several organizations remained silent, fueling speculation that many Democrats had abandoned Preckwinkle when she really needed them. Obama’s former Senior Advisor Valerie Jarrett endorsed Preckwinkle in the final weeks of her mayoral campaign. Obama, whose mansion is in Hyde Park where Preckwinkle lives, endorsed Preckwinkle during her campaign for a third term as Cook County Board President. Lightfoot in her victory speech promised to heal the wounds, after a bitter campaign season among two strong Black women.